(From an email to The Rake magazine, published in Minneapolis MN). Friday night, I received a package containing snapshots of a friend’s garden in Minneapolis. Thanks Stuart!! I opened the envelope at dinner, and passed the images around a table where I was sitting. The amazing thing about receiving mail in Antarctica — any mail — is how everything seems fresh, exotic. Oooooh — purple coneflowers and zinnias!! What is that — corn?? Mint? Chives?!?? You’d think we were looking at photos from Mars. I should mention that the McMurdo kitchen is officially “out of freshies” (fresh vegetables, fruit), nearly out of real eggs, etc. I’m pretty sure we used up our last lettuce at Thanksgiving. Folks have already reported seeing spinach salads in their dreams…. I’m not dreaming of salads, myself, since I’m scheduled to fly back to lush New Zealand soon — too soon — perhaps on the very plane that brings in new freshies for Antarctica. But it’s a long flight back to New Zealand, in a Hercules military transport plane, and I’m fresh-out of unread magazines (a common affliction). What a joy to discover that my package, mailed from Minneapolis, contained an unblemished issue of The Rake — the December issue, no less!! — featuring Brad Zellar’s account of the ore-boat traverse with photographer Stuart Klipper. 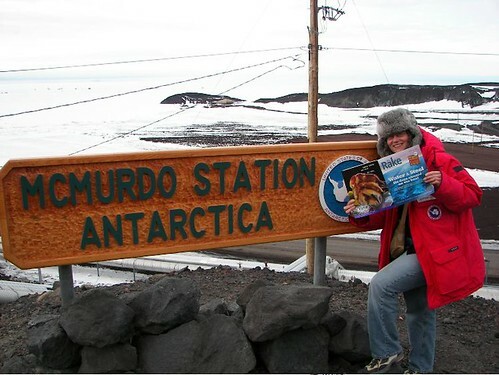 Current issues are celebrated in Antarctica. I just returned from a remote field camp where the most current magazine was a Log Home Living (the “flooring” edition) from 2001. It felt quite strange, reading about luxury log homes on a continent with no trees. Note that photos were taken just after midnight, by the official Station sign, looking out onto the frozen Ross Sea where an ice-breaker will arrive, later this month, linking our port to the open sea. This will allow a supply ship to reach Antarctica. It is Austral Summer on the Ice. The sun doesn’t rise or set, it just rolls around in the sky, casting shadows from all directions. I’ve been in Antarctica since October 31, writing poems about science as a participant in the National Science Foundation’s Antarctic Artists & Writers Program.